It’s impossible to live in the Boston area and not have an opinion about Boston Marathon bomber Dzhokhar Tsarnaev’s apology, which he delivered in federal court Wednesday as he was formally sentenced to death. For what it’s worth, here’s mine. I think he was sincere — up to a point. I’m sure he sincerely wishes he didn’t find himself in this predicament, and he would have to be inhuman not to be affected by the victims’ stories that he heard during his trial. He is not inhuman, though he committed inhuman acts. 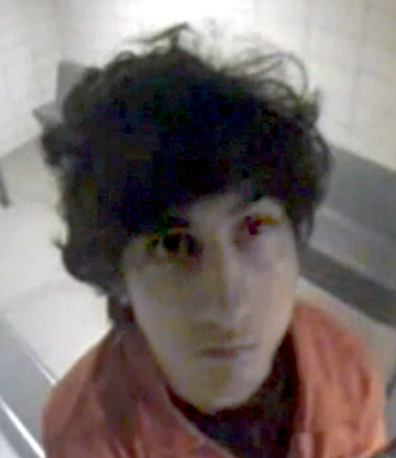 In the years to come, I hope Tsarnaev comes to a more genuine sense of repentance. And though it’s only natural that we focus on what motivated Tsarnaev to act as he did, we should never forget that the people who truly matter are Martin Richard, Krystle Campbell, Lingzi Lu and Sean Collier, as well as their friends, families and those who were injured. And I am struck that his request to plead guilty and take life in prison was denied by our government because they want nothing more than create an example of this young person for his bad choices. Yes, he’s wrong in commuting the acts, but a full fledged terrorist who was completely radicalized, not even close. He was what an accidental terrorist if you want to use that word for him. Unfortunately for him, he was brought down by a powerful justice system that still incorporates a barbaric form of punishment and we made darn sure we were going to flex our super big muscles by giving this person the worst possible punishment. There is a collective consciousness out there to do unto others as they have done unto you. Well, that can be used for good and bad. We failed in Jahar’s case to show the world that the U.S. isn’t only about an ‘eye for an eye’ mentality, but that we can be just and punish without all the political baggage from post 9/11. We were hungry to show our power and angry to execute anyone who dared to strike at us. This kid made a bad mistake and I’m sure he regrets every moment of it. I actually have sympathy for him and feel the punshment does not fit the crime. I’m also glad he admitted guilt and stood before everyone to offer an apology even when the energy in and out of that room, against him was so intense. Why are people questioning is sincerely. Once again, it’s never enough to even offer an apology. Angry people can never stop and for a second realize it’s okay to accept someone’s apology even when they don’t agree. The media, local and national, excerpted the most sympathetic parts of his statement, where he acknowledges the impact on the victims. But, read in its entirety, the statement shows someone who still apparently sees himself on his jihadist mission, doing Allah’s work, and thinking that Allah will judge him as most deserving of mercy. Not sure that there’s much there in authentic contrition. Cynthia Murphy’s comment cries out for some feedback. I’m glad Ms. Arons-Barron provided the context of the entire apology as opposed to the excerpts. I’m not sure how you can come up with the term “accidental” terrorist when you consider what he did prior to, during and after the bombing. And what he and his brother planned to do if they made it to New York. If you can read what he wrote in the boat and say he wasn’t when completely radicalized. It’ mind boggling to think otherwise, quite frankly. I also think it’s important to say that it was not “the government” that “flexed their muscles” here. A jury of 12 citizens from a region where the death penalty is viewed somewhat dimly listened to the case presented and rendered their verdict. I think the most impressive part of their verdicts was the fact about how selective they were, on which counts he was found guilty, culpable and subject to the death penalty. This was clearly a group that very carefully rendered their decisions. You should go back and see how meticulous they were in dissecting each charge. It actually made me very proud of our system when I read through the charge by charge findings. If anything he is fortunate that under our system that he was given the benefit of consideration and deliberation. Would that he have shown as much toward the dead and grievously wounded. I’m not sure how you know he regrets every moment of his “bad mistake.” I can’t think of a more presumptuous stance regarding this individual and a more dismissive trivialization of a horrific crime. @Bill: It should not be forgotten that all 12 jurors supported the death penalty. They couldn’t be empaneled if they didn’t. By the way, reports coming out now are that Tsarnaev adopted some weird Arabic-sounding accent in delivering his apology. Stranger and stranger. I know I’m a little late here, Dan, but I just wanted to toss something in that you repeated that many people have said which is not entirely accurate. They were not 12 people who supported the death penalty; they were 12 people who during voir dire said they could follow the law and if required, vote for the death penalty. Huge difference. They could not be dismissed because of opposition to capital punishment, only discharged if they say their conscience wouldn’t allow them to vote for the death penalty if warranted. There may have been several people on the jury who were personally opposed to the death penalty but, taking their civic duty under a solemn oath, agreed to follow the law wherever it led. As someone who has covered countless trials, I never cease to be amazed at how seriously people take their obligation when they are impaneled on a jury. @Jack: If you can sentence someone to death, then you support the death penalty. Pretty simple. These were good jurors who took their duties seriously. I have enormous respect for them. But they all supported the death penalty. As a death penalty opponent, I would have been disqualified from serving. @Jack: Again, if can you vote to impose the death penalty then by definition you support it. Very few people will ever have an opportunity to support it in as tangible way as these 12 people did. Given that, it really doesn’t matter what they said previously. @Jack, The death penalty is never required under federal law. None of these jurors said they’d impose the death penalty “if required” by the law. What they did all say is that they could impose it if they deemed it to be the appropriate punishment. And there are several of the 12 who deliberated whose responses, by ANY definition, suggest support for the death penalty. And the 2 who said they did or thought they did oppose it in the past, quite specifically said their opinions changed either as they got older or as they thought about it, so add them to the supporters too. I agree with Dan, though: If you are willing to say you can impose it, you support it. Good point, Dan. But I would also remind that they applied it in a selective fashion that directly indicates there was not vindictiveness at play here, but a high degree of reasonable consideration. On the issue of the statement, I’m not sure where Marjorie is getting from it that he thinks “Allah will judge him as most deserving of mercy.” Where is that in his statement? He asks for mercy on all and then adds that Allah will be the judge. He doesn’t say anywhere that his request for mercy on himself is the one that will (or even is more likely to) be granted nor that anyone else won’t be so granted. While it is a deeply religiously-steeped statement (which isn’t to my taste), I also don’t see anything in there that supports Marjorie’s contention that it shows him to be on a “jihadist mission.” I don’t see anything in there about jihad. I don’t know what she means by “doing Allah’s work,” but, even if it’s that, I’m not sure that should be conflated with being on a “jihadist mission.” He praises Allah and defers to Allah on the granting of mercy, but where’s the jihad in the statement? I’m not saying the statement is anti-jihad; it’s not that either. I found a copy of the sentencing verdict form (http://ftpcontent3.worldnow.com/wfxt/pdf/Tsarnaev%20Completed%20Jury%20Form.pdf), so to answer my own question: There is simply no way to tell how many jurors did or didn’t want the death penalty on all of the capital counts. Having read through this form, I’m even more puzzled at Bill’s contention here that we should be particularly impressed by it. That it suggests some degree of consideration by at least someone on the jury is about all that can be said for it, but–for a life or death decision in a month’s long capital case–that is saying very little.